The Delta 4 rocket has accomplished a critical three-peat for the nation in flawless style, successfully capping a series of repetitive but highly important U.S. weather satellite launches with a beautiful blastoff at nightfall Thursday. A trio of orbiting observatories, known as the Geostationary Operational Environmental Satellites N, O and P, booked rides aboard Delta 4 rockets to get into orbit and serve meteorologists across America. That teaming paid off superbly with three picture-perfect launches in 2006, last June and Thursday evening, deploying a new generation of satellites that will be the mainstay in weather monitoring for many years to come. "GOES is not just any satellite. It's more than that, it's more than most. It's all about saving lives and property. That's one of its primary goals, and we don't take that responsibility lightly. We make sure we do this job right," said Andre Dress, NASA's deputy project manager. The Delta's main engine rumbled to life with the trademark hydrogen fireball harmlessly racing up the rocket, then the pair of solid-fuel boosters strapped to the first stage ignited to propel the 20-story vehicle away from the launch pad at 6:57 p.m. EST (2357 GMT). Arcing eastward over the Atlantic Ocean, the rocket ascended to space and disappeared from view at Cape Canaveral en route toward a geosynchronous transfer orbit that would take nearly four-and-a-half hours to reach. Three systematic firings by the cryogenic upper stage stepped the attached GOES P satellite initially into an initial low-altitude parking orbit, then into an intermediate orbit and finally achieved the desired altitude to deploy the payload. The targeted release orbit included a high point of 21,860 statute miles, low point of 4,100 statute miles and inclination of 12 degrees. Satellite-builder Boeing will spend the next three weeks maneuvering the satellite into a circular geostationary orbit 22,300 miles over the equator where it can match Earth's rotation and appear parked in the sky. NASA will take control March 24 to conduct an extensive five-month testing period before the satellite is declared ready for use in NOAA's weather observing system. GOES P is a $500 million mission that won't immediately go into service. Instead, the craft will become an in-space insurance policy against any potential disruption in weather data from other satellites, just waiting for one of the older craft to finish its usefulness before being activated as a replacement. The GOES program has a long history of providing the weather imagery seen daily during news broadcasts, allowing meteorologists to track conditions and forecast the future across North America. "We all look forward to those pictures every night on TV to see where the storms are and where they are heading. That is GOES' main job," said Tom Wrublewski, NOAA's technical acquisition manager. "The meteorologists at the National Weather Service inject this data from the GOES imager and sounder into their daily forecasting products," Wrublewski continued. "Our National Weather Service is using this data to see how rapidly storms are developing, to see the altitude storms are getting to, to see whether hail is being formed and so on." This satellite is the third in an updated series of weather spacecraft with sharper vision and extended life to provide constant observations of clouds, atmospheric conditions and severe weather like hurricanes. "The new series of satellites is about a factor of two improvement in our ability to locate severe storms," Wrublewski said. "It's going to allow people to predict better warnings where lines are going to be for hail and tornados and severe weather of that nature. And GOES can uniquely stare at those storms to see how they are developing over time. So a couple of kilometers make a big different whether it's in your town or somebody else's town a couple of miles down the road." That increase in accuracy is key for forecasters plotting the paths of hurricanes. "For every mile we don't have to evacuate, that saves about a million dollars and not disrupting people's lives," he added. "This satellite is absolutely critical to accurate hurricane forecasting and warnings," said Bart Hagemeyer, meteorologist in charge at the National Weather Service forecast office in Melbourne, Florida. "It's amazing how the GOES satellite imagery, which is now ubiquitous on the TV and Internet, really helps the public understand the weather, too." The satellites also carry Solar X-ray Imagers to study the Sun and its storms that can impact life on Earth by upsetting satellites, inducing glitches in power grids and interfering with navigation and communications. A suite of space environment sensors is aboard GOES P as well to monitor the magnetic field and charged particles. "The SXI is improving our forecasts and warnings for solar disturbances, protecting billions of dollars worth of commercial and government assets in space and on the ground, and lessening the brunt of power surges for the satellite-based electronics and communications industry," said Tom Bodgan, director of NOAA's Space Weather Prediction Center. The two primary satellites currently in operation are GOES 11 in the western coverage zone and GOES 12 in the east. But the nine-year-old GOES 12 will be repositioned in April to focus on South America for the rest of its useful life. The GOES 13 satellite, which was launched in 2006 under the name GOES N, will be brought out of orbital storage and placed into service as the new eastern craft. GOES O, renamed GOES 14 after rocketing into orbit last June, now awaits the call for duty. Projections show it replacing GOES 11 at the end of 2011. That will make the new GOES P, which will be re-branded GOES 15 after a successful delivery to orbit, the constellation's main spare. NOAA wants backup satellites already in space and ready to take over within 72 hours of a primary craft suffering a problem or failure. GOES P was launched now since the opportunity was available on the Delta 4 rocket's schedule and there's no real harm in storing the craft in orbit. It's also cheaper than paying for care-taking on the ground. "We are very anxious to get this satellite launched and maintain our continuity of service," Wrublewski said. "It will be a great feeling for NOAA because it helps guarantee we're not going to have a break in service, it will give us the flexibility to put satellites covering the east coast and the west coast, and later this year we'll even be able to dedicate a satellite to help South America out." The long-range expectations foresee the satellite remaining the spare until replacing GOES 13 (formerly called GOES N) sometime in 2015. But any surprise glitch aboard one of the operational birds would require GOES P coming to the rescue far sooner. Boeing built the GOES N, O and P satellites and oversaw the launches under a commercial arrangement with the government. 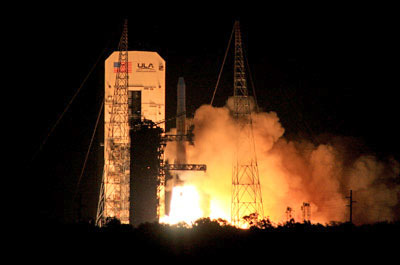 A Delta 4 Medium+ vehicle was used in launching the 7,000-pound spacecraft. This particular "4,2" version of United Launch Alliance-built rocket featured a four-meter payload fairing and two strap-on solid rocket boosters. "This has been a tremendous nearly four-year partnership to place all three GOES satellites in their proper orbit," said Jim Sponnick, United Launch Alliance's vice president, Delta Product Line. Some team members had worked 12 years designing, building and launching these new satellites. Now that all three are in orbit, many will be moving on to other development projects. "We have worked with a lot of excellent people in industry and NASA and NOAA. A lot of their lifetime and their career dedicated to this series of satellites. Everybody is extremely proud. What other job could you have when you know you are helping to save lives and property every day. It is a great mission," said Wrublewski. "It's sad and happy," Dress said of this final launch in the series. "We have done our job but at the same time a lot of us will be on to something different and what that is we're not sure yet."